I don't often make cupcakes. I am not a huge fan of them to be honest, although they do look so pretty and tempting. However, a while back I bought a set of large piping nozzles from Lakeland and I wanted to try them out. I got in touch with Prezzybox and asked them if they could send me one of their Mini Cupcake Makers to try and before I knew it, it had arrived, all pink and pretty. Cooper was very excited to try it out. Every time I turned round he would be following me with the box. He couldn't wait for the weekend to come and the making of the cakes. The Mini Cupcake Maker is super easy to use. When you take it out of the box, give it a quick clean then wipe it over with the smallest amount of oil and switch it on to heat up. This takes about 5 minutes. Then spoon your cake mix in, until each well is 2⁄3 full (there is no need to use cases, although you can if you wish). Shut the lid and leave the cakes to bake for 8-12 minutes and voila. The cutest little cupcakes that just slide out of the wells. I used the recipe on the box for my first trial, just adding a little vanilla for extra flavour. I was very pleased with them. A good basic recipe to start with. I piped orange flavoured butter icing onto the cupcakes once they were cool. What a diffence it makes using a decent sized nozzle. It make icing the cakes a breeze. The icing wasn't perfect, but much better than my previous attempts. A good basic vanilla cupcake mix. 1. Add your butter and sugar to a stand mixer and mix until pale and fluffy. 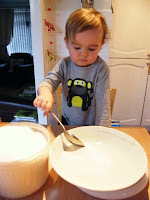 (You can do this by hand or use an electric hand whisk)2. Add the vanilla, milk, eggs and flour and mix until combined. Do not overmix as this will result in a heavy cupcake.3. Spoon some of your cake mix into each of the wells until they are about two thirds full.4. Bake for 8-12 minutes until a skewer inserted into one of the cakes comes out clean.5. Slide out of the wells and leave to cool on a rack before icing.notes: If you are baking these cupcakes in an oven. Spoon the mixture into cases and bake at 325f/160c/140c fan/gas 3 for about 16 minutes. 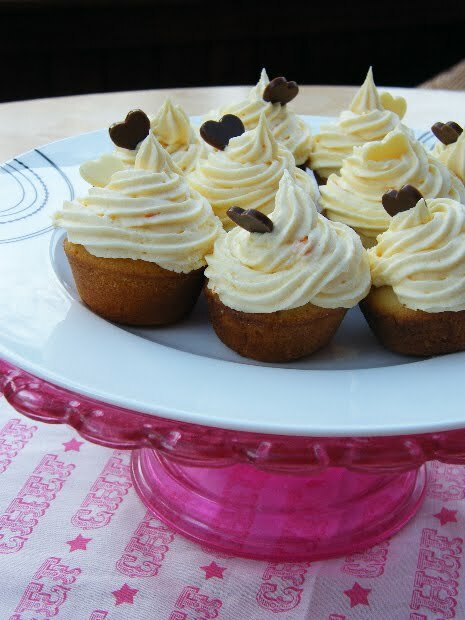 Do the skewer test with these too.I have given the time for one batch of cupcakes using the cupcake maker. 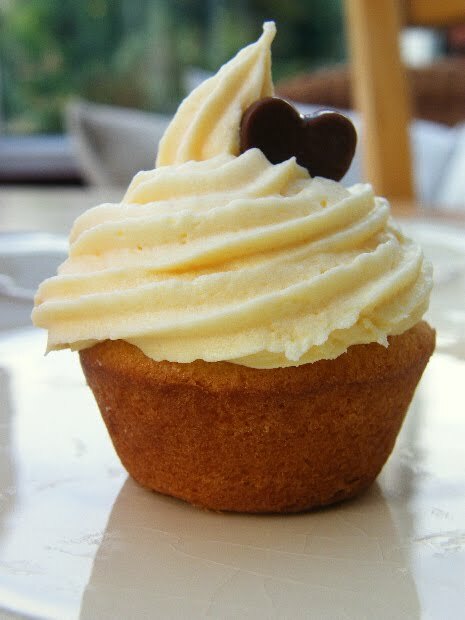 Fresh orange juice and orange peel give this butter icing a lovely subtle orange flavour. 1. Whizz the butter in a stand mixer (you can also use a whisk or an electric hand whisk) until really soft.2. While the butter is whizzing gradually add the icing suagr, orange juice and peel. Whizz until smooth.3. Pipe onto your cupcakes preferably using a disposable piping bag (less washing up) and a large nozzle (gives a more professional finish).4. Top with a wee chocolate decoration or any other decoration you prefer. 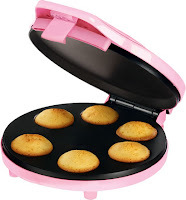 The Mini Cupcake Maker from Prezzybox, comes in at a bargian price of £19.95. They also have a large selection of other Cupcake Goodies. Disclosure Statement: I received this mini cupcake maker free from Prezzybox to review. I was not required to write a positive review. The opinions I have expressed are my own. These look lovely. I don't make many sweet things but I was given a set of piping nozzles for Christmas and still haven't used them so this has reminded me of what I need to do! These look so cute and it's great to see your lil one baking with you. I always prefer a cake to cupcakes. I have to admit I would love to get some piping nozzles and get creative like this! welll they look divine, I love the simplicity of the cupcake maker and I must say your icing technique is superb! a win win in my book! I'm not all that crazy about cupcakes either, but I think mini ones would be fun! Personally, I'd much prefer to bake it in the oven. I would love to give this a try..It looks awesome..Bookmarked it Dear..
Adorable! The orange/butter frosting sounds divine. There was no doubt that these little bite were appreciated Jacqueline. I am very impressed by your piping - I can't pipe icing to save myself and I only want to learn so I can pipe mashed potato - one day!!!! It is tasty Angela, but not too overpowering. Those are decorated so nicely! You should make them more often and sell them. I like that you can only make 6 cupcakes if you want... I can be a bit of a cake monster so I always arrange to take any baked goods to work to share. Have you tried making muffins in it? That would really sell it to me! Awww thanks TB, although I don't know where I would find enough time to make enough to sell. Hi Sarah, I haven't tried muffins in in it yet, but they should work just as well. I will let you know. They look lovely Jac, and it's good to know that this gadget works well. Glad to hear you're enjoying piping with bigger nozzles - I could spend hours at a time just piping buttercream, it's such good fun! look beautiful!! really love them! It is good fun C, but I think I still need to keep improving. Getting a text Q&A service called ChaCha to give me recipes for all my meals for a month... a dry run for doing something bigger with the same idea later in the year. Should be good! They look great. I am loving anything in mini form these days. Yum! you are a magician! Goodbye waist but that worth it!